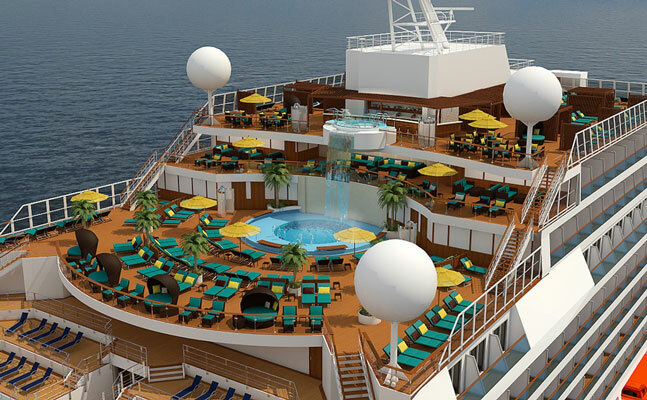 Sailing on Carnival's Fun Ship, "Sunrise"
Cost includes all meals, entertainment on board ship provided by cruiseline, all taxes, fuel, port charges, fees, and GRATUITY (no tipping at the end of cruise), and W-HOTS GIFT (prices are subject to change – book early). DOES NOT INCLUDE THE W-HOTS ENTERTAINMENT PACKAGE. Book early, cabins are limited. 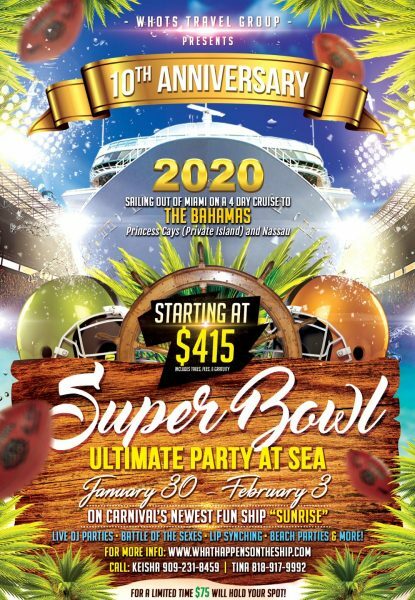 PRE-CRUISE HOTEL STAY: A block of rooms are available for check-in on Jan 28 and/or Jan 29 and out Jan 30, 2020 and/or post-cruise @ FAIRWIND, located a block from the South Beach, the W-HOTS group rate start at $199. To book, click on the W-HOTS custom link: https://us01.iqwebbook.com/FHMFL941/~/?coupon=WHOTS. Includes air (LAX), transfers (from airport to hotel & from hotel to ship), 1 or 2-night hotel stay on Miami Beach. General Conditions: To reserve your space an early reduced deposit of $75p/p is being offered til MAY 10, 2019 (for balconies and suites full deposit of $150 per person is due at the time of booking (BALCONIES AND SUITES are limited)) after this date the deposit due is $150 p/p along with this registration form (to claim the location of your stateroom book early with your full deposit of $150 per person as rooms are extremely limited and prices are subject to increase)! *Call for past guest rates, military rates, etc (prices may be lower). The next payment of $100 p/p is due by JULY 19, 2019; the next payment of $100p/p is due by SEPTEMBER 20, 2019; with the FINAL PAYMENT due by NOVEMBER 2, 2019. *The ALL-IN PACKAGE requires a deposit of $150p/p and monthly payments of at least $100p/p with the final payment received by November 29, 2019. Note: a payment plan that works best for you can be arranged and full payment can be made anytime prior to final payment due date. All passengers may need a valid passport. For information on passport requirements, visit: http://iafdb.travel.state.gov/. Single occupancy is 200% of the per person price. Taxes, fuel surcharges, port charges and all fees are subject to change. There is a $75.00 cancellation fee for all cancelled bookings. The Cruiseline/Airlines/Hotel fees will be additional and are based on date of cancellation. If cabin is not paid in full at final payment date a $50 late fee may be added and cabin is subject to cancellation. Trip Cancellation insurance is highly encouraged. For additional information contact your group leader or Travel Agent Robbi Andrews @ (323) 295-3938.